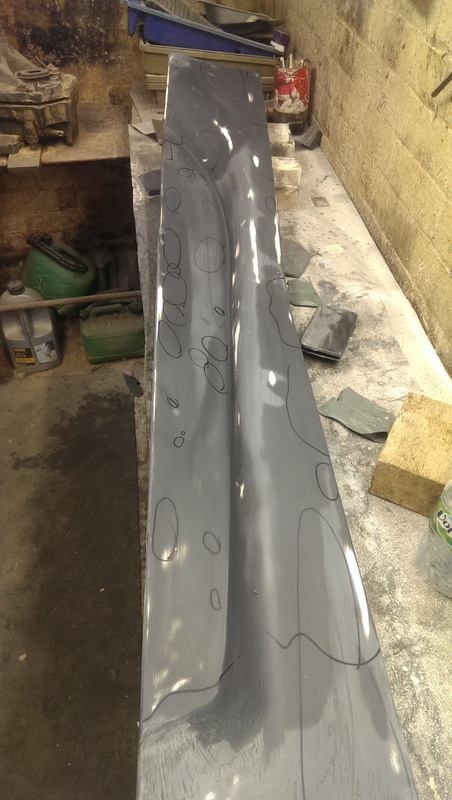 As I’m working on the exhaust routing at the moment, I decided I would also work on the side pods in parallel so that the clearance to the side pod can be checked. I forgot to take any pictures of the side pod rough sanded, before I sploged hi build primer all over the part. The second photo shows how things look once I have blocked over the part with 240 grit to cut the worst of the imperfections out. Then I went over the panel with a sharpie marking up some the bits I would like to fix. This is the worse of the panels I have and it is not as bad as the pictures make it look. 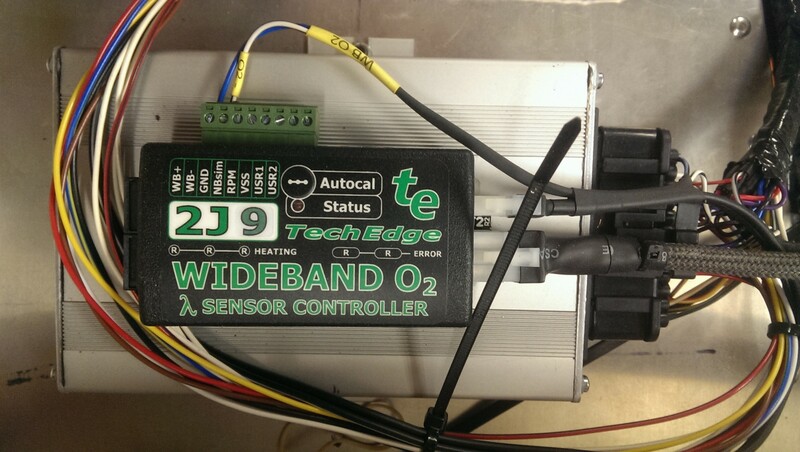 The wideband o2 box was fixed in place with some velcro and the crank sensor plug fitted to the loom. I went to the pub last week to meet a number of ex-colleagues. while we where chatting topic of technical debt came up. Witch reminded me that I have not been all that good at keeping a record of the wiring loom. So I have been working on a spread sheet and some drawings of how every thing is connected. Once I work out a good way of embedded the information in the blog i will get it posted to keep the debt to a minimum. Filled with enthusiasm because of the wheels I went down to the work shop to get some stuff done. 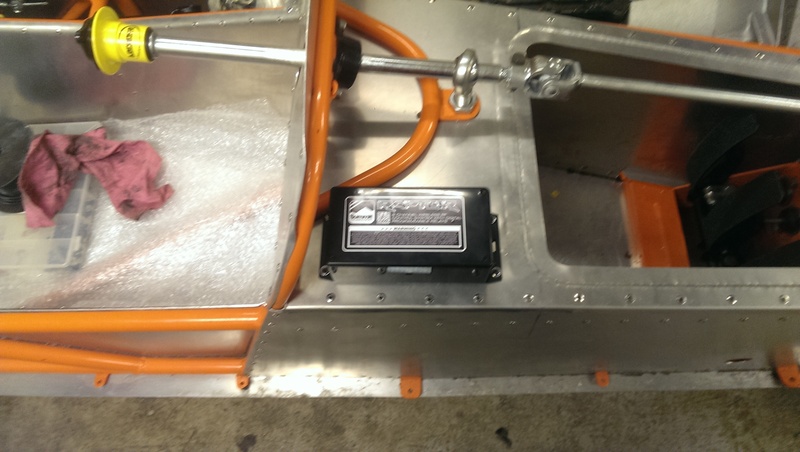 I started out by wrapping the first parts of the engine loom and permanently tagging it in to place on the chassis. 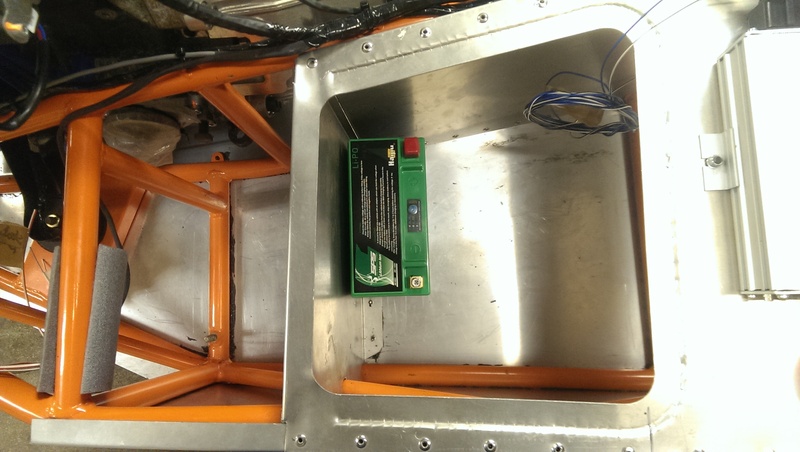 Then moved on to looking at locations to mount the battery, I’m planning on putting the dry sump tank in the section of chassis after the passenger foot well and I don’t feel comfortable having the battery next to the tank because it will get hot. 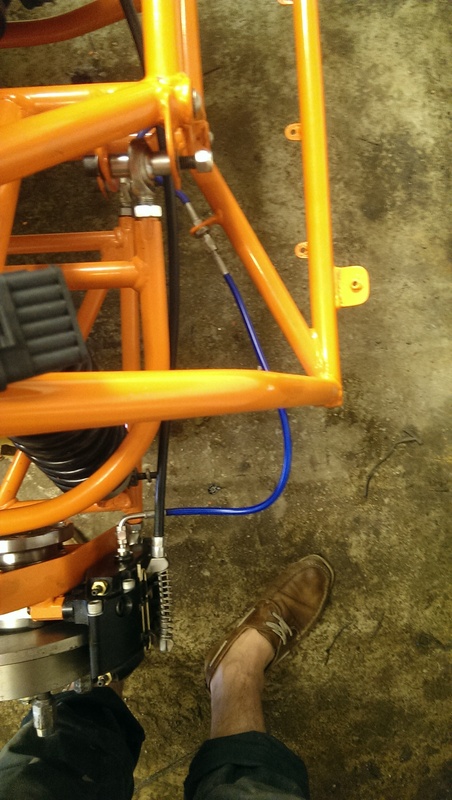 The obvious location are the passenger foot well, on top of the gear box or maybe down by the steering rack, I have not decided yet. 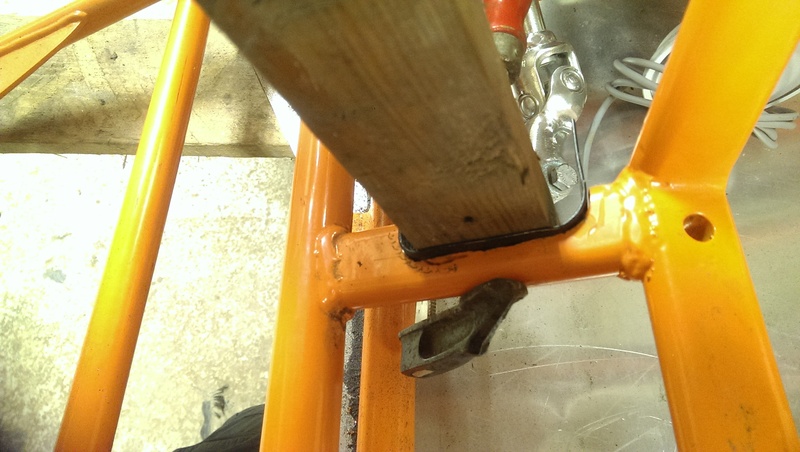 Finally a couple of weeks ago I notched this rail so that the steering rack UJ does not catch, so I bent up a plate to close the rail. I just need to borrow a MIG welder and weld it in then the steering can go back in permanently. Another blog I read remarked that he had not got as much done, over the weekend as hoped for because “had to spend some squirrel time with the wife ( ooh look at that squirrel ect ect )” which made me smile. However it’s a good point about time management, when ever I go to the work shop it feels like very little gets done and I don’t seam to get to the work shop as ofter as I would like. My squirrel time, was visiting Speke hall a Tudor wooden framed house. The work shop time was spent on the engine loom, a task that does not photograph well. I know this looks like the last two pictures of the engine, with wires all over the shop, but there is light at the end of the tunnel. All of the cores have now been run to the ECU and routed to there locations on the engine. The ECU is connected in to the main loom and all the cores are labeled. The last job before wrapping the loom and adding the connectors is to run the supply for the coils packs up to the top of the engine. Then with any luck it’s job done and time to move on to the next job. I was working in France agin this week, when I got home some parts had arrived so I nipped out to the workshop this morning to get some bits and bobs done. The straight brake flexes that I had ordered did not clear the shock. luckily they can also be ordered from Furore products with a 90 bend and all sorts of different fittings. 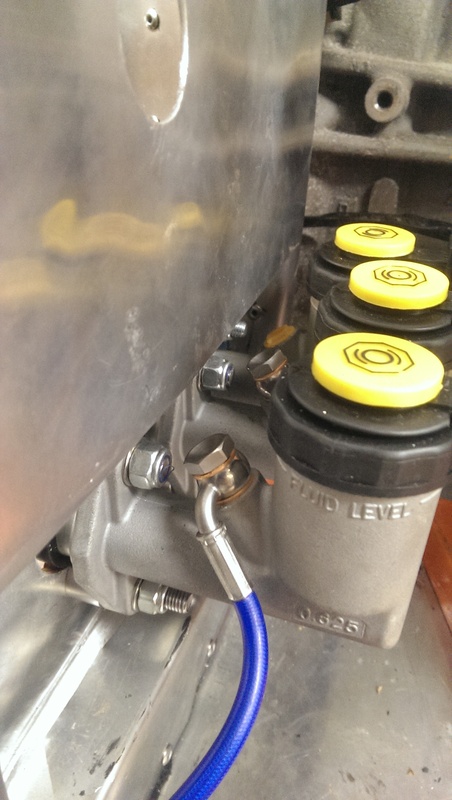 It took a couple of moments to fit the replacement hoses installing them slightly twisted so that that will say clear of everything that might rub on. 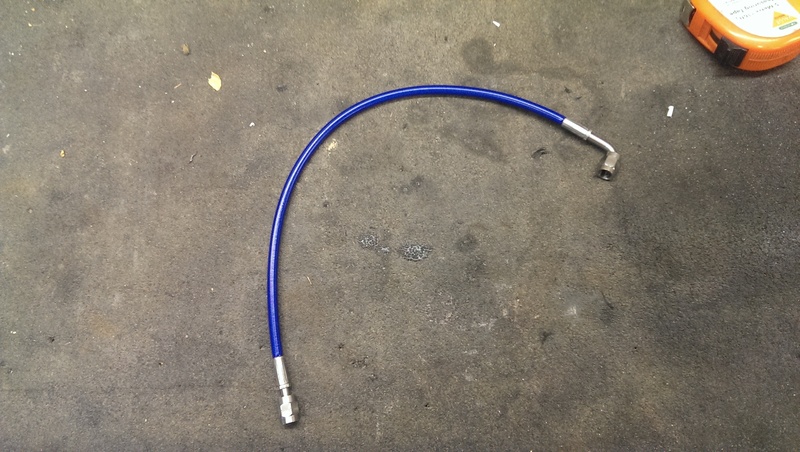 The other delivery was a short section of shielded twisted pair for the CAM sensor that crimped come pins on and connected up on the ECU. The final task for the morning was putting tape flags on all the wires and labeling everything ready to start running the cores in to there final locations. I know this looks a lot like the last picture of the wiring but I really have done stuff. The eagle eyed amongst you may also spot that I swapped from sandals to slip-on shoes this is following a safety observation from a coligue. Over the weekend we where at a friends wedding. As can be seen from the picture above, I suffered a dance floor injury. and im hopping that things get better in time for the run. 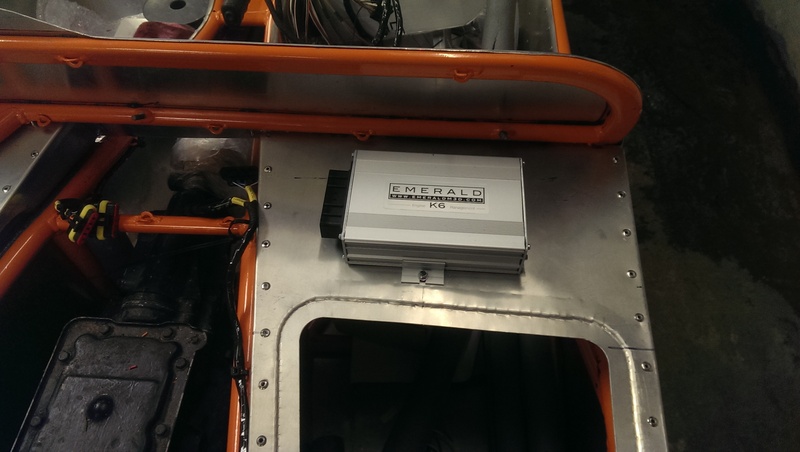 I bought this Emerald K6 ECU a bit back for the project so it has been sitting in the cupboard for a while, weighting to installed. 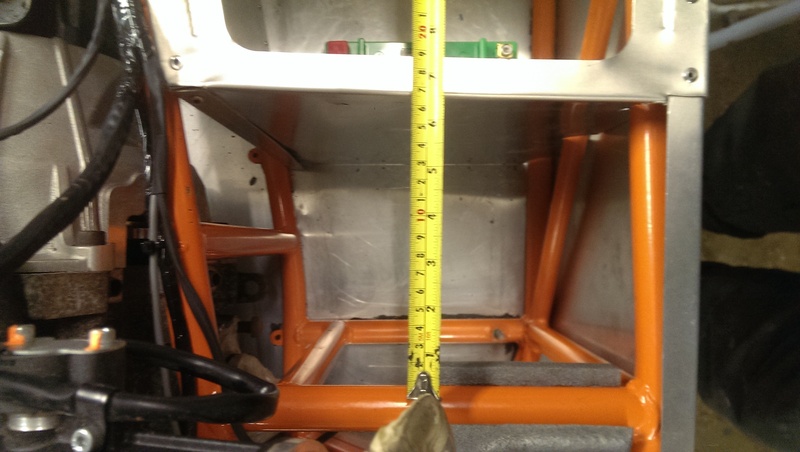 The tub went back on to the chassis, so that I could mark up how much space there is in the main tub. 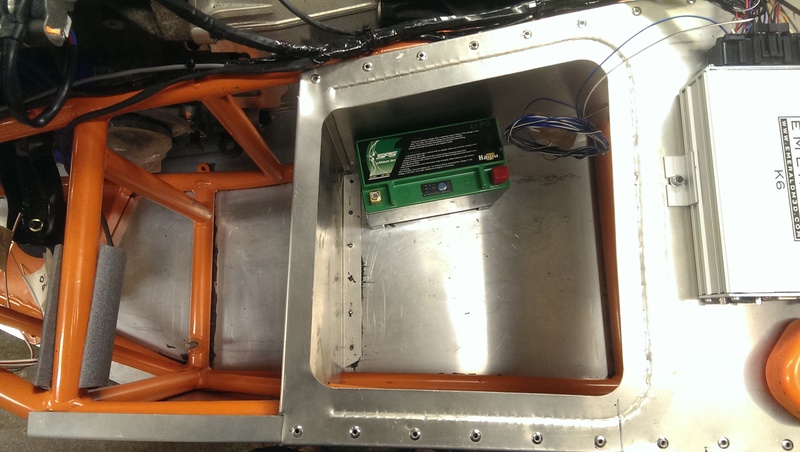 With the Tub off the chassis again, the ECU and Raptor where mounted up behind the dash. Leaving space for the loom to be run along behind both components. Emma drilled all the holes and mounted both boxes. 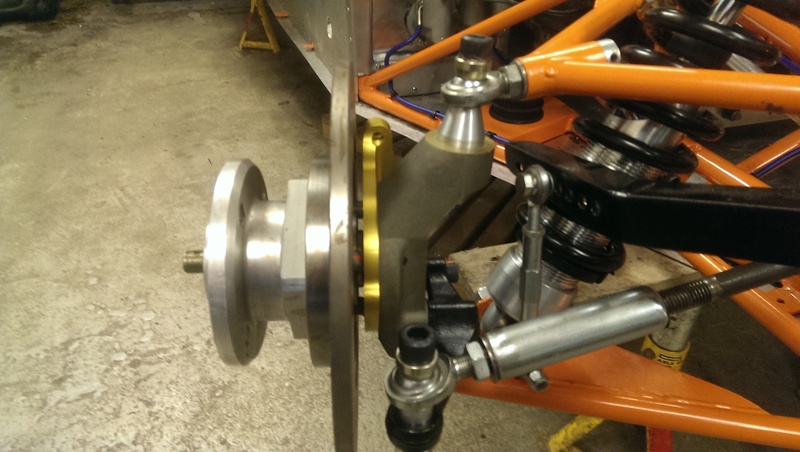 The final install of the front suspension, with all of the spacers made by Doctor Derek Doctors on locost builders, is now complete. the spacers are all fantastic quality. 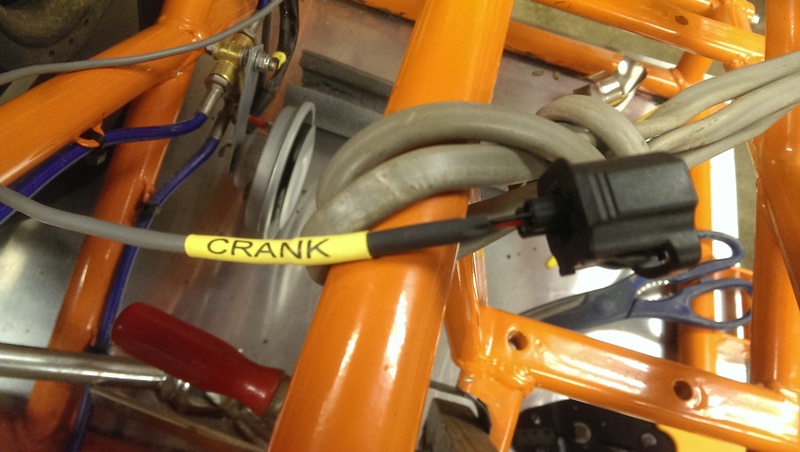 So now I can measure up for the brake lines and get them ordered this week. I have also ordered a set of wheels so once they arrive in a couple of weeks, I will be abol to get the car down on its wheels which is a mile stone I have been looking forward to for some time. After yesterdays stella progress. I was not surprised that today, nothing really got done. 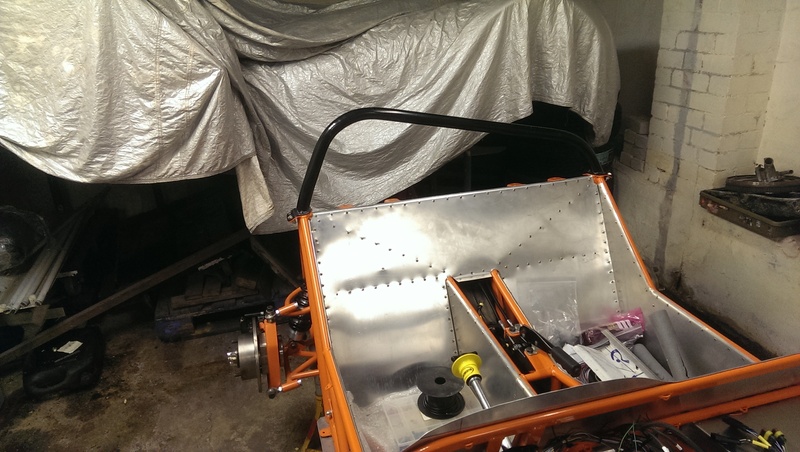 I started out with a nice easy job, bolting the roll bar on to the chassis. This will make getting the body work on and off a bit harder. 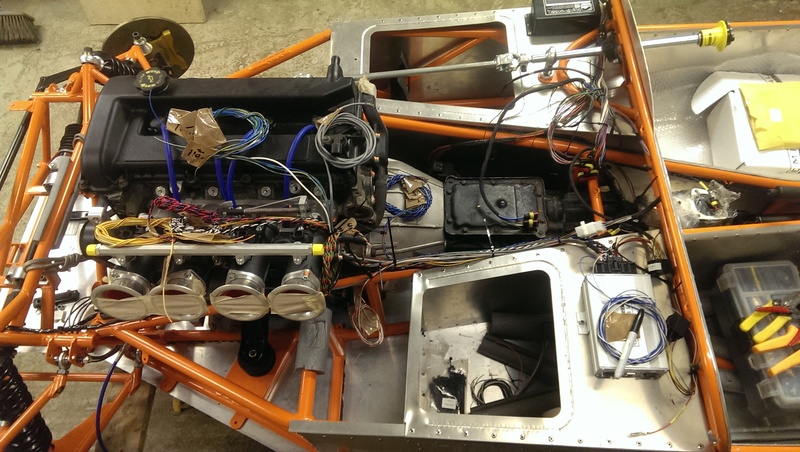 But will make sure that the body work is correctly located on the chassis. I replaced some of the wires that link the fuse box and relays, with much longer wires, so that I can locate the relays and fuse box where I would like on the chassis. 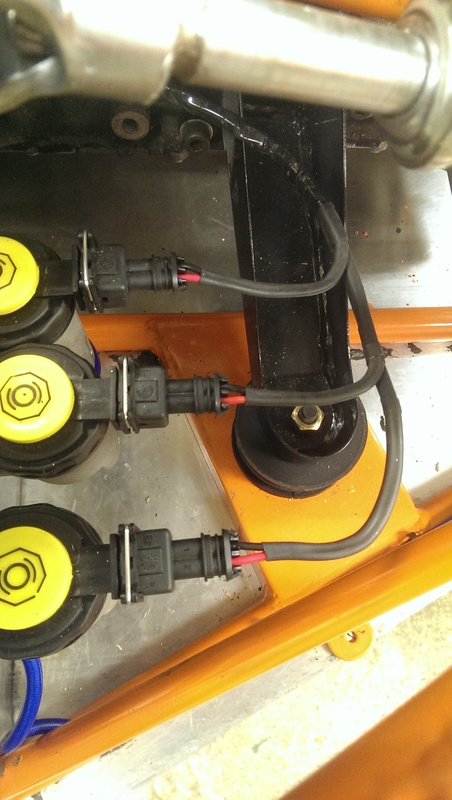 Finally I connected up the sub loom for the fluid low level sensing and connected the brake lines up to the master cylinders. 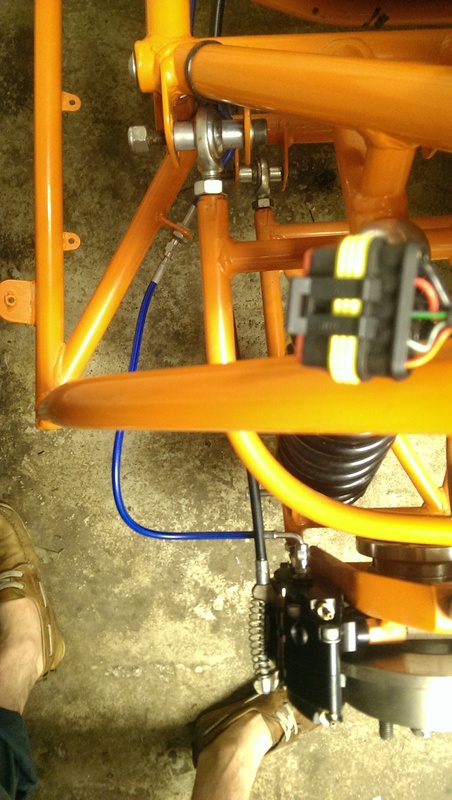 When the bolts for the front uprights arrive, I will be able to measure up and get the last brake lines made up.